Get more done in less time with the fastest & most efficient browser. Surf the web at ease with non-stop protection for your online security and privacy. Tired of big companies imposing things on your face? You are free to pick your own style and flavor here. Tired of all the obtrusive ads that attempt to track everything you do online, irritates your eyes and wastes your time? Welcome to the ONLY browser that automatically blocks ALL ads. No plugins, opt-ins or configurations needed. Enjoy a clean and ad-free web at lightning fast speed. Tired of being watched all the time by big companies like Facebook or Google no matter where you go? You can rest at ease here. Rebuilt from the open-source Chromium project, Slimjet doesn't send any usage data back to Google like Chrome. On top of that, Slimjet is armed with the most advanced anti-tracking technology to thwart various attempts to invade on your privacy (e.g., track your identity or profile your behavior) by the intrusive businesses. Loaded with powerful features & flexible options, Slimjet does more for every user without relying on external plugins. Automatic protection against phishing and malware, advanced privacy control options, robust sandboxed multi-process architecture. Fed up with all the annoying ads? Kill them all with the built-in ad blocker. Boost the performance of your browser by saving memory, CPU and bandwidth consumed by the ads. Slimjet comes with a turbocharged download manager which uses multiple connections in parallel to download files up to 12x faster. It also lets you resume a download job between browser sessions. Smarter and more convenient than the basic password manager in Chrome. Save page url and login data in a form file which lets you open your favorite online account with a single click later on. 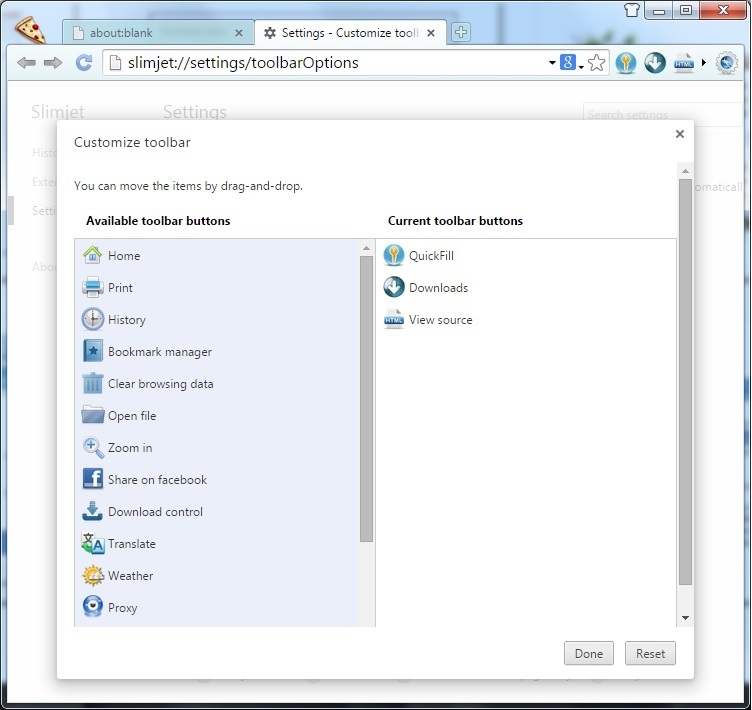 Slimjet let users customize the toolbar and add/remove additional buttons to quickly access more features and functionalities. Record any online screaming video or other dynamic content in any web page into a local video file. Record and play offline later on. 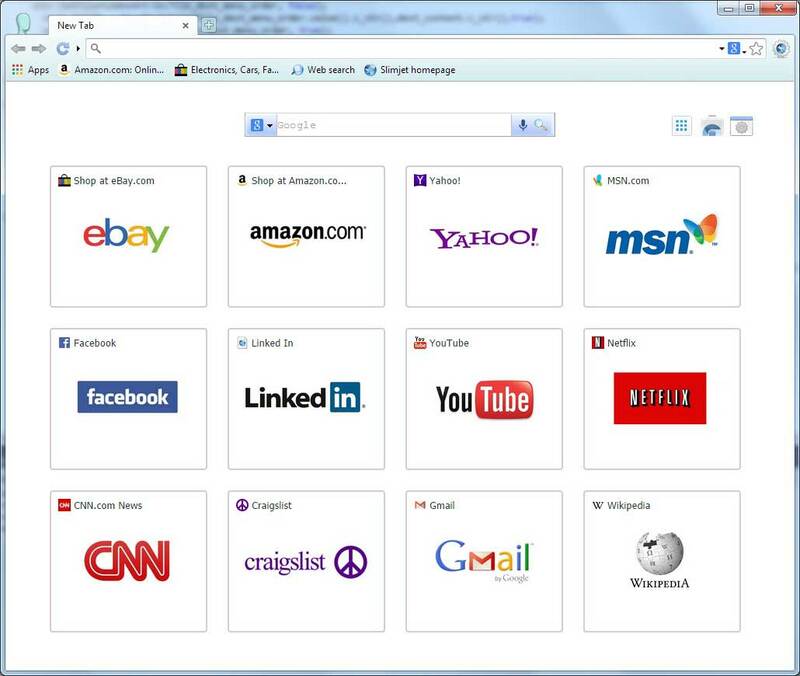 Slimjet is compatible with most plugins and extenions designed for Chrome, such as Adblock Plus, RoboForm, LastPass, Avast Online Security, etc. It is also compatible with all the chrome themes. Slimjet includes advanced and flexible anti-tracking options to prevent various attempts to track your identity and profile your behavior. Slimjet includes a Photo Salon in which you can apply different effects or add beautiful frames to the photos before they are uploaded. You can customize the number of quick-dial buttons and the background image. 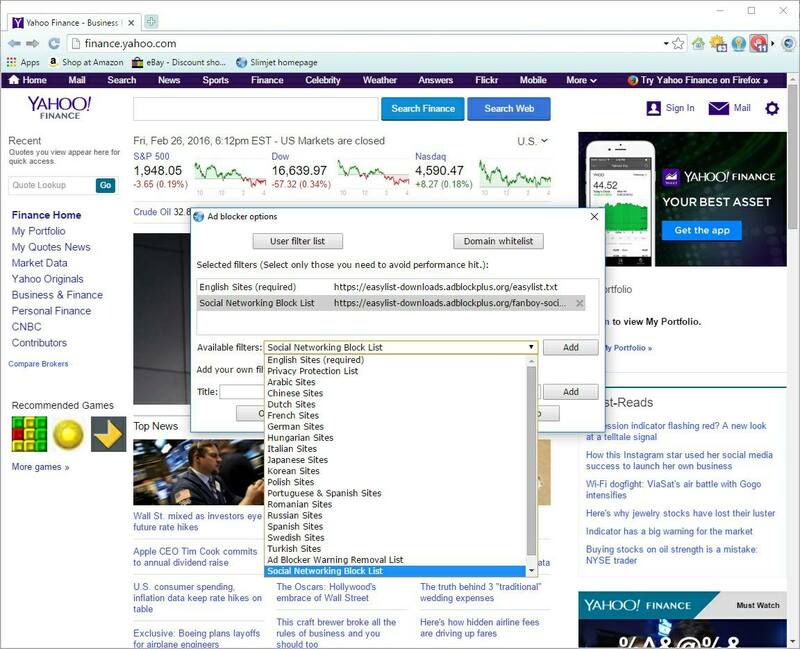 Multiple search engines and voice input are supported on the search box in the New Tab page. Full mouse gesture support is included in Slimjet. It lets you perform frequent actions by drawing predefined shapes with your mouse without touching the keyboard. All the bookmark, history and other settings in Slimjet are automatically synced via the cloud server. Keeping the same bookmarks and data on different computers is never easier. Up to 12x with multiple connections. 1x with single connection. 1x with single connection. 1x with single connection. FlashPeak has produced what Google should have. Slimjet is an amazing browser—faster, more stable, and more customizable than anything out there. Slimjet is one of the best browsers I've ever used. It's a Chromium fork but it's better than big names, because it's more flexible, more customizable and has a lot of good features. I've tried tons of browsers, but none of them is complete, fast, customizable and secure like Slimjet. I just downloaded slimjet together with the recommended ad blocker. Got the pages I want in a blink with no annoying and distracting ads. Slimjet is officially my default browser. Slimjet beats every other browser I have tried in terms of speed and performance. And it comes with so many handy utilities to help me do things faster. Keep up the great work! Slimjet works great on my old Windows XP box. Finally I can ditch the Internet Explorer 8.0 that is no longer supported by Microsoft and has compatibility issues with many sites. Switching from Chrome to Slimjet was a no-brainer for me. I hate Chrome does many features via hidden switches. Slimjet lets me access great features with a few easy clicks. Auto refresh one or more web pages based on a preset period. 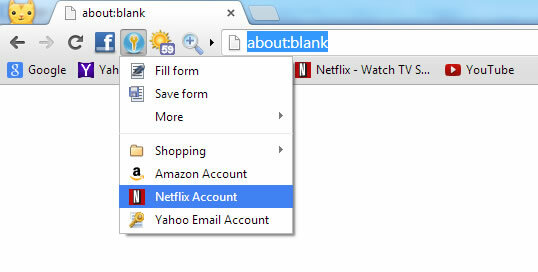 Get quick access to more bookmark links and folders with the bookmarks side panel. 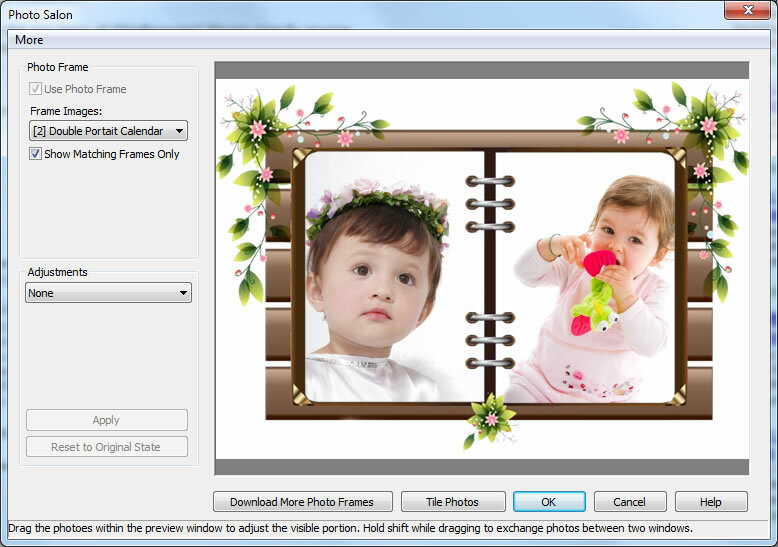 Save screenshot of the entire page or selected region as an image file. A simple switch can be flipped to stop all gif animations (most of them annoying ads) from playing. Option to allow mixed http/https content to run properly. A simple switch to quickly disable all desktop notifications that many users find annoying in Chrome. Upload image stored in clipboard quickly without having to manually saving it to a file first. Added support of login id and preferred password to the autofill feature available in Chrome. 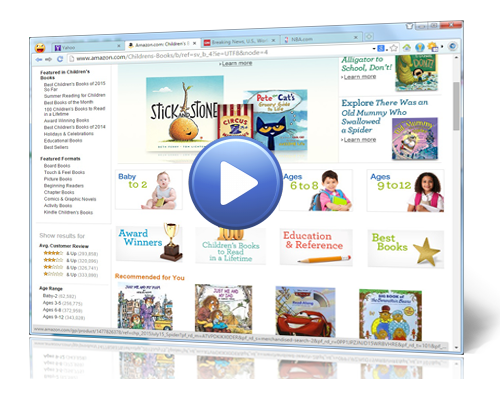 A drop down button is available at the right end of the omnibox which allows users to quickly switch between different search engines. Options to control automatic tab activation, automatic tab creation, tab insertion order and more. How to open a new tab in foreground by default? How to stop all the gif animations? How to disable the annoying desktop notifications? How to remove the notification icon? How to save a screenshot of a web page? How to automatically create a new tab when I enter a url in the address box? How to block all the annoying ads? How to change the search engine used by the omnibox? How to migrate Slimjet settings and data from one PC to another? How to close all the tabs without closing the browser? How to disable WebRTC in Chrome/Slimjet? How to migrate from SlimBoat to Slimjet? How to block all the annoying ads in my browser? 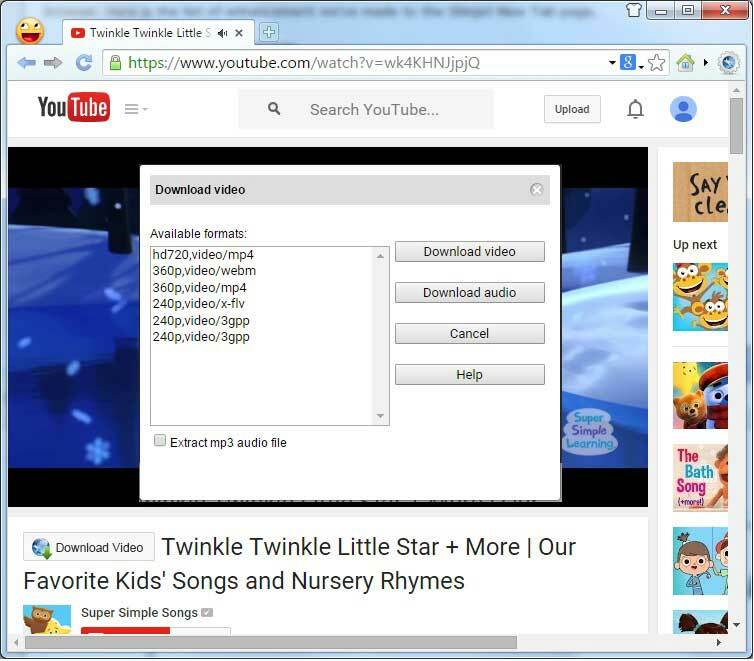 How to download mp3 file from a youtube video? How to hide / remove profile switcher button?